Text If this card is Tributed by a card effect: You can add 1 Spellcaster-Type "Nekroz" Ritual Monster from your Deck to your hand. 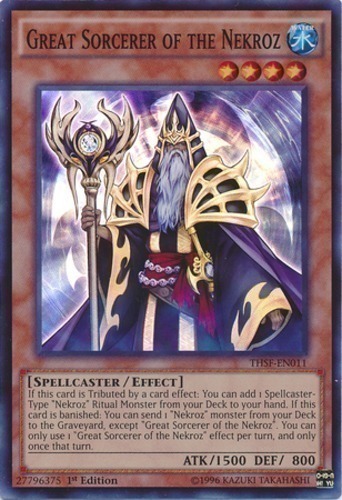 If this card is banished: You can send 1 "Nekroz" monster from your Deck to the Graveyard, except "Great Sorcerer of the Nekroz". You can only use 1 "Great Sorcerer of the Nekroz" effect per turn, and only once that turn.